I'm working on something BIG and exciting that I can't share yet (AHHH, though I want to! ), but in the meantime, I'm staring at the latest border for my original design medallion quilt - rainbow wonky piano keys! I currently have two very selfish, very awesome long term projects: the epic Anna Maria Horner Medallion, and my Meadow quilt). If I chip away at them in little pieces between holiday and deadline sewing, I make progress on everything. 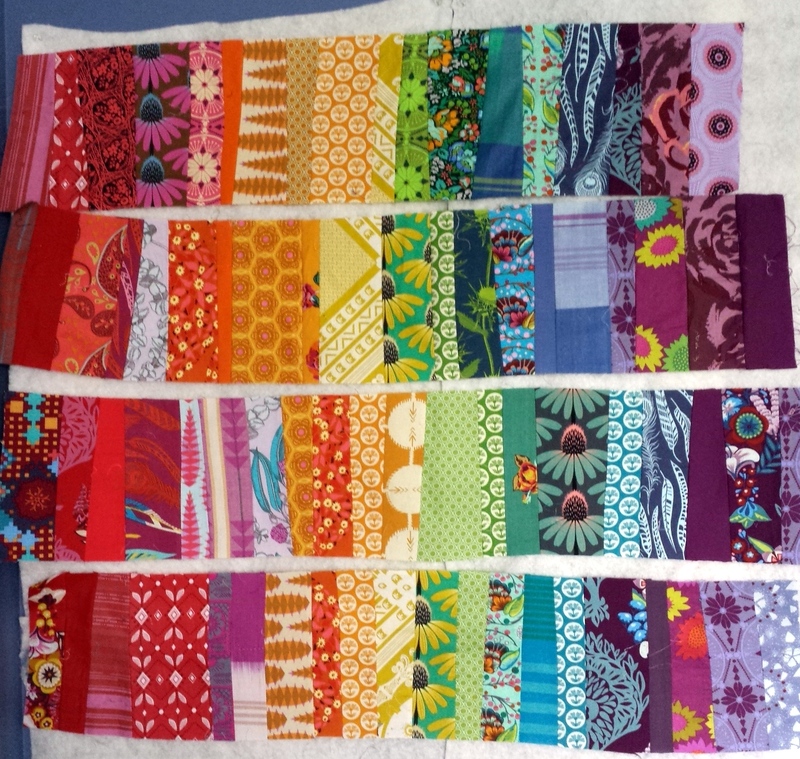 I've been dreaming of which fabrics I'm going to cut in next; I'm going to need more of these rainbow strips, and so far, this is just from my scraps. I'm enjoying piecing them together at random, wonky angles. It's a freeing, therapeutic, and cheering activity! Also this week: just like many of my projects, I am a work in progress. 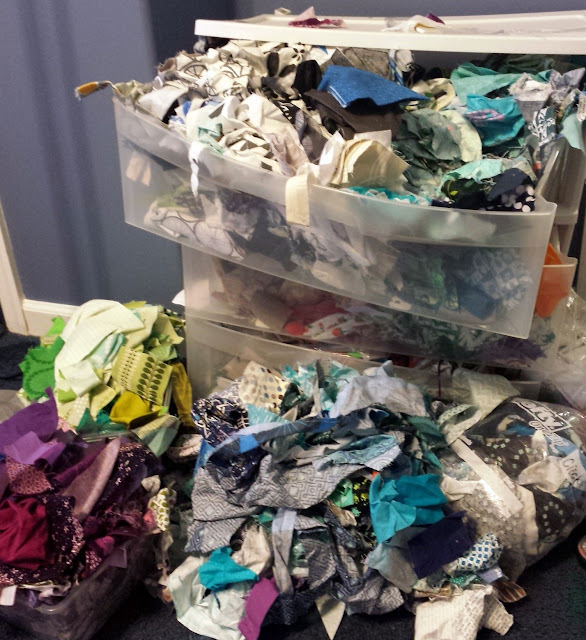 I've been surprisingly successful at keeping my new sewing room clean, but my fabric scraps got out of hand. After our latest move, the plastic drawer set that I bought from Walmart five years ago was at capacity. Even with all the scrap quilts I made this year, I'm always creating more scraps. 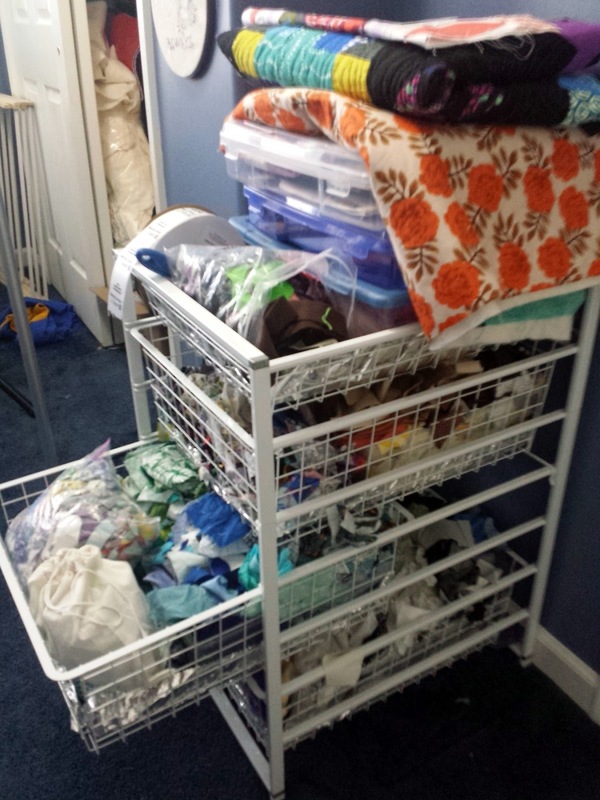 Honestly, the plastic drawers were probably at capacity two years ago. It didn't look like this all the time, I swear - just when the drawers opened! 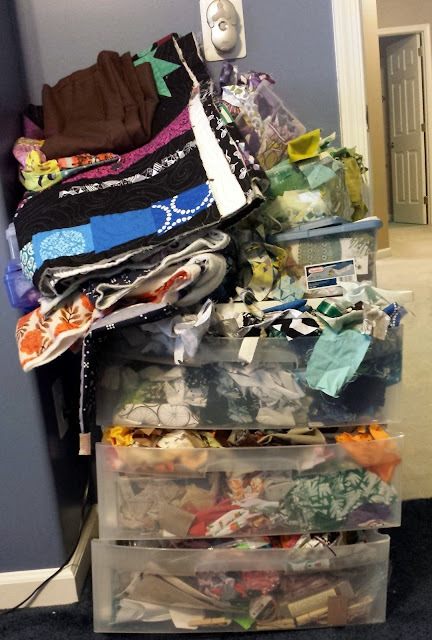 I decided it was high time to address the scrap problem - throw some out (the teeny tiny pieces, the ones I'll never use because they are poor quality, etc. ), pack some away to give away to the guild, and organize anew. 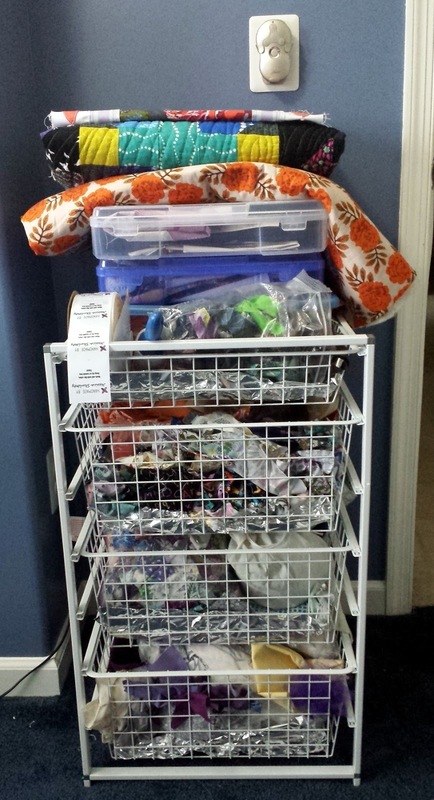 Luckily, my sister had a set of wire drawers she wasn't using, and after some begging she gave them to me. What a nice sister! In addition, Mike is going to use the plastic drawers for his computer stuff. No money was spent on this reorganization - recycling all the way! Hooray for rainbow order! The wonky piano key borders are looking great. And I love the new scrap storage that you have. Happy (early) birthday, I hope you have a lot of fun planned / in store. Happy Birthday, I read last years post, and we all at some point in our lives go through the who am I and how do I fit within the fabric of my career choice. You are blessed to get this lesson early. At 49 I became disabled and could no longer work, what could I have done different? Art and sewing took the space of a career very nicely and I kept telling myself that it would be fine. 7 years later, I realize that it has worked out, but I still have no time for those selfish projects. Just reading this now, so the timing is perfect to wish you a very happy birthday. Your blog brightens my days. I hope that same happiness comes right back to you all through the year, Jess. Hurray for scrap organization! I love being able to pull out my bags of color instead of digging through everything.